I was never much of a comic book reader as a kid, but I did love Garfield. As a chubby, lazy kid with a cynical sense of humor, perhaps I could relate to him on some level. Or maybe it was because we shared the same favorite food: Lasagna. It was, and still is, one of my favorite meals. 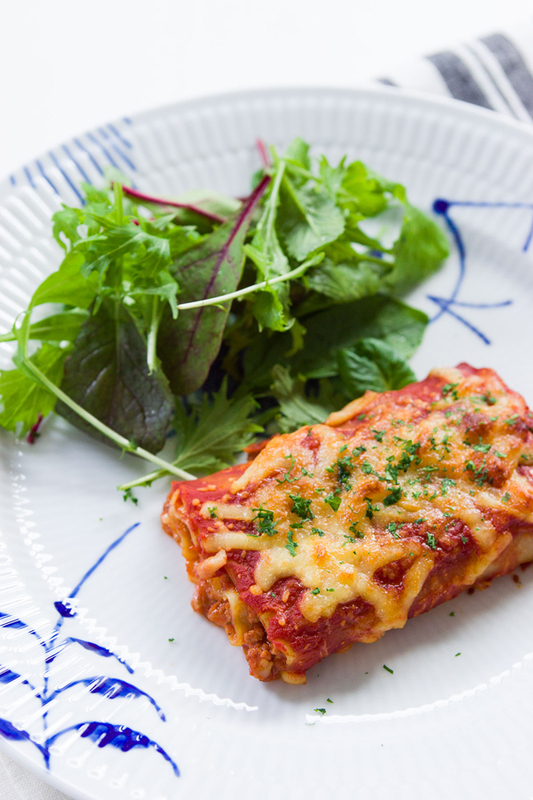 Unfortunately, lasagna isn’t one of those meals you make for one, or even two, so it hasn’t been on the menu much since I moved away from home. 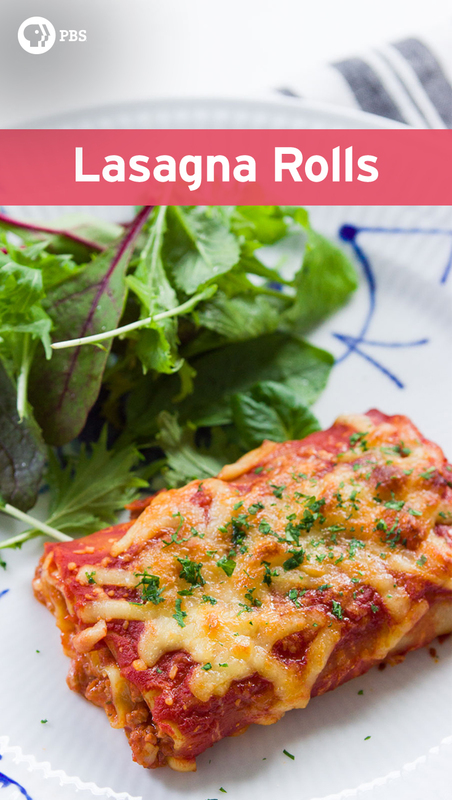 Determined to make a more compact version, I tried a couple different approaches including making it in a loaf pan, but these individual rolls strike the perfect balance of sauce to noodle, and they don’t get soggy like the ones made in a casserole dish. 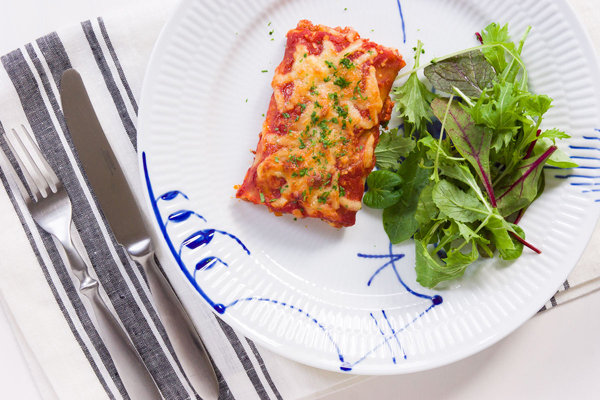 Best of all, they’re super easy to serve as they’re already portioned, and you don’t have to worry about a structural failure as you transport a piece from the pan to a plate. 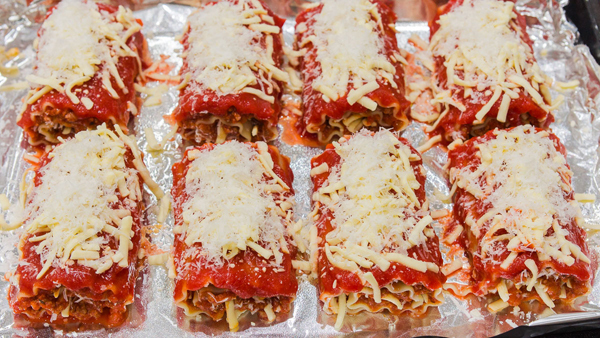 These Lasagna rolls still take a fair amount of work, especially if you plan to start by making a proper bolognese, but if you already have some sauce on hand (or head to the store and buy some), these can be put together in about thirty minutes. If you don’t have two hours to make my Bolognese, my easy meat sauce recipe can be made in about thirty minutes, making this a one hour meal, perfect for a Sunday supper. Add 1 tablespoon of oil to a large pot of salted boiling water and boil the noodles for for about 30% less time than the full cooking time on the package says. 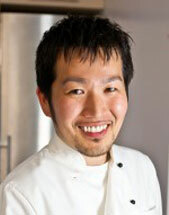 For example, my noodles call for cooking them 12 minute to be fully cooked, I cooked them for 8 minutes. Drain the noodles and rinse with cold water to chill enough to handle. 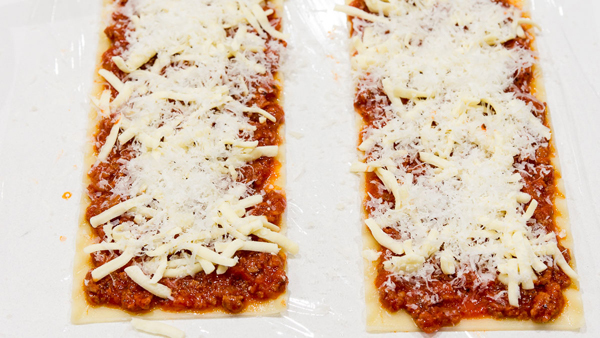 On a clean work surface (I used some plastic wrap on the counter), lay out all the lasagna and divide the meat sauce evenly between all of them. Reserve about 1/3 of each kind of cheese to sprinkle on top, and then divide the mozzarella and parmesan between the sheets of pasta. 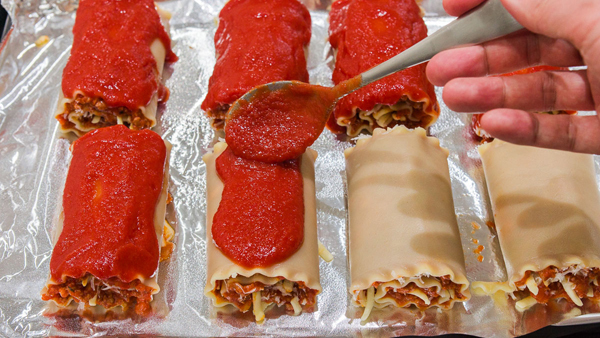 Gently roll the pasta up, being careful not to squeeze out all of the sauce. Using a spatula can help with this. Place the rolls on an oiled baking sheet. 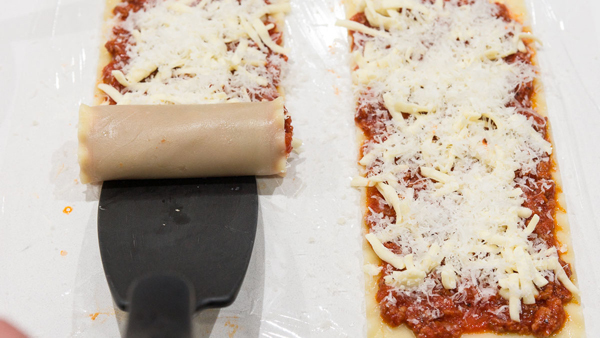 Spoon the tomato sauce evenly over the rolls making sure to cover every outside surface, especially the edges. Missing spots will result in the noodles getting tough. 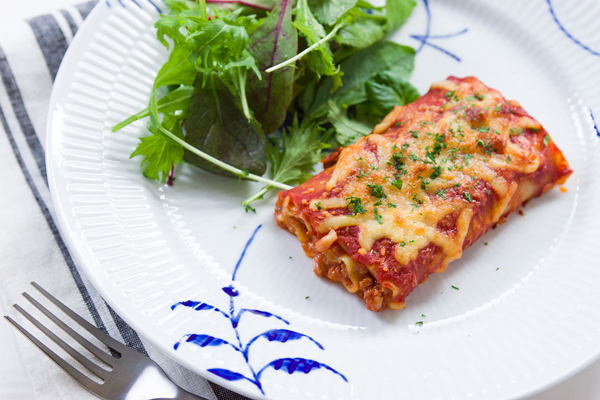 Sprinkle the rest of the cheese on top and bake for 20 minutes, or until the cheese is melted and golden brown.